Chora in Serifos. Restaurants. Cafes. Bus. 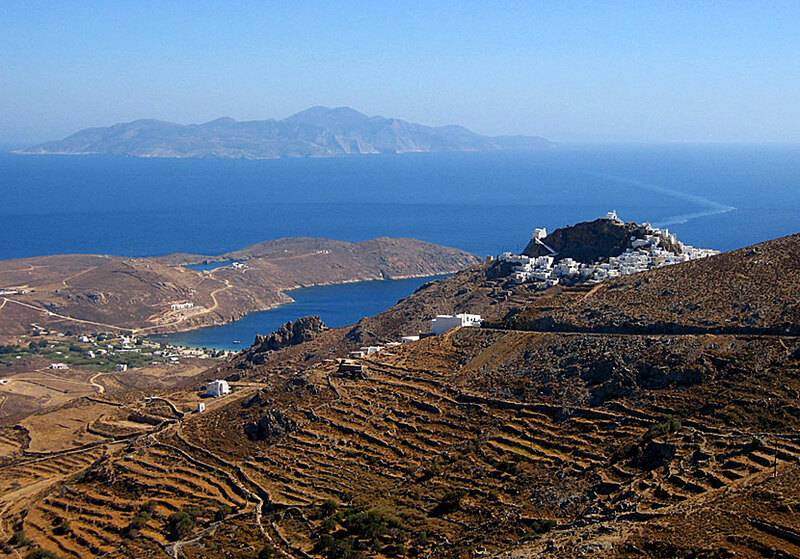 Chora on Serifos is one of the Cyclades' absolutely most beautiful villages. And from a distance the village is probably the most beautiful of them all. The white cube houses climb steadily up to the top of a hill where a Kastro (castle) and some chapels completes the beautiful picture. The first time you disembark from the ferry at the port of Livadi and you catch the sight of Chora you will be eager to discover it. To appease your curiosity you can choose between bus, car or scooter, or as many do, hike along the old cobbled donkey path. If you choose to walk, you have about a 2 kilometres uphill ahead of you. It takes about 45 minutes. The winding main road is 5 kilometres long. Chora is traffic-free, donkeys is the only means of transport. You kindly have to park your vehicle outside the village. 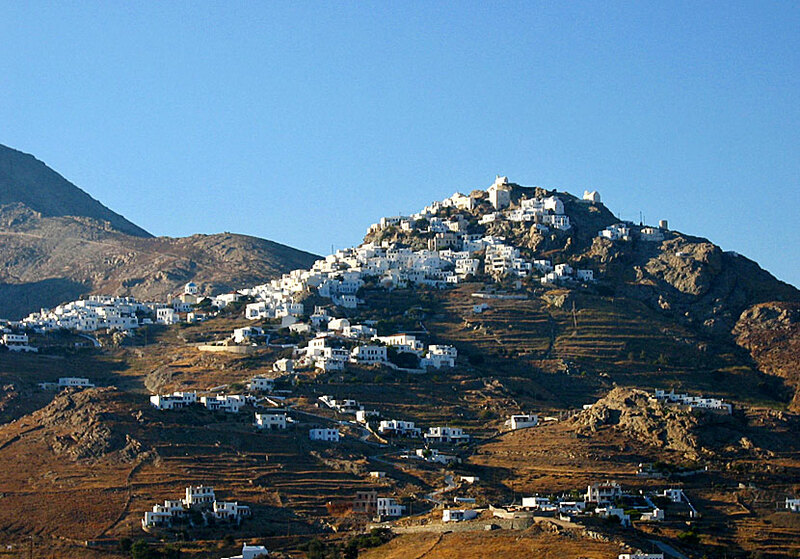 Chora is Serifos' administrative centre, but far from its tourist centre. Here are few traces of tourism, the Greek everyday life has the upper hand in Chora. 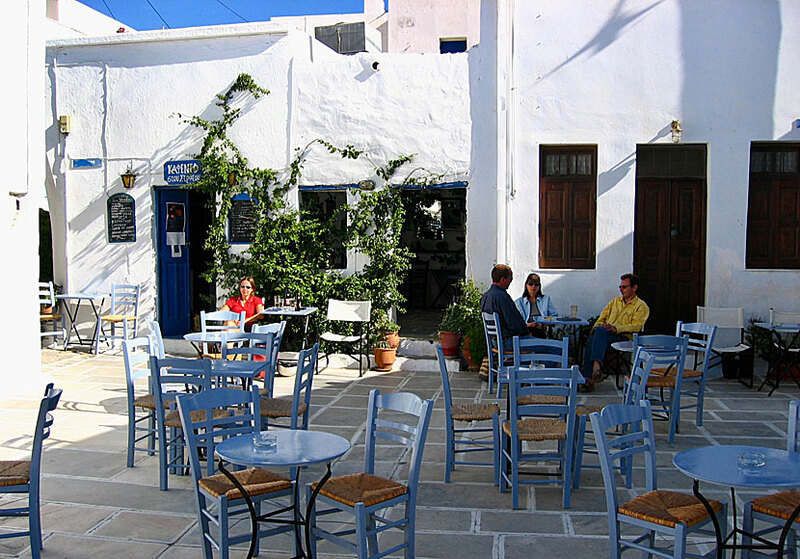 From the lower square, at the junction with tavernas and kafenións, several narrow alleys lead into the village. Aim at one of the alleys and find the way up to the top where the village's kastro perch. The view overlooking the bay of Livadi is breathtaking from the chapels. And I really mean breathtaking. From the opposite side of the village, at the grand windmills, you get a more overall picture of Chora itself. View of Livadi from Chora. When you are tired of looking at the views, find your way down again, follow the arrows towards the square and you will not get lost. Chora's square is like an illusion, like a scene from a Greek filming, as if someone were commissioned to design the ultimate village square. In other words, it is really picturesque. The cozy square in Chora. 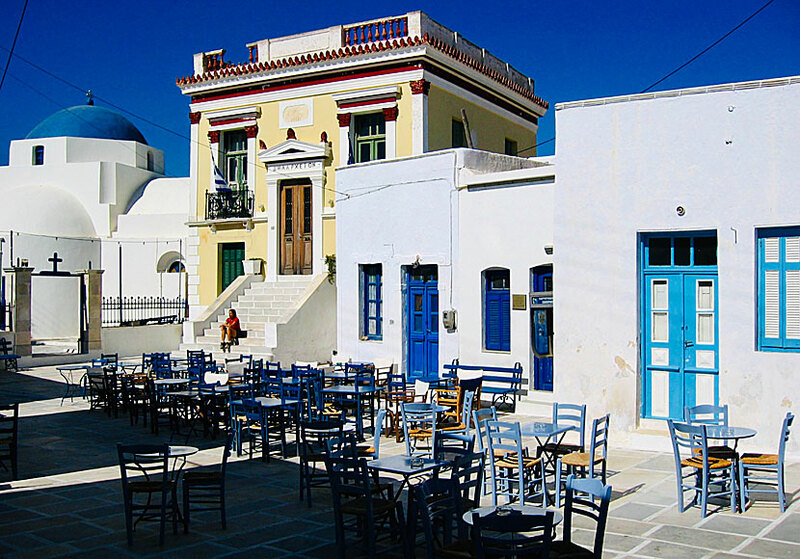 At the farthest corner lies the church of Agios Athanasios and the fancy town hall in neoclassical style, just opposite lies Taverna Zorba and in the other corner lies the pleasant Stou Stratou, a very nice and cosy cafe and once you are seated it is difficult to leave the place. Stratous, the owner of Stou Stratou (meaning "Home at Stratos") opened this unique cafe in the summer of 2001. He then took it over from the previous owners. Stou Stratou and part of the square in Chora. Stratous has carefully renovated the building and also opened a small extension so that you can also sit inside. Of course it is also possible to be seated on the beautiful square. Stou Stratou mainly serves all sorts of drinks (please try Raki with honey) and light meals (mezé) and tasty breakfasts. Good music, dreamy beautiful environment and a super friendly owner makes Stou Stratou to be one of the most congenial places I know. Open between 10:00 and 02:00, closed during the siesta.